Republican presidential nominee Donald Trump speaks to Democratic presidential nominee Hillary Clinton during the second presidential debate at Washington University in St. Louis, Oct. 9, 2016. A major showdown is coming Tuesday, when American voters make their presidential choice. What's a showdown? It is political slang that requires some explaining for international audiences, says David Burke, an author and host of the TV show "Slangman's World." "A 'showdown' comes from the Westerns where you have a cowboy tell another cowboy, 'This town isn't big enough for both of us,'" he told VOA. "Then the two cowboys go outside, take 20 steps away from each other, and they shoot. ... The one standing is the winner." The presidential election happens much the same way, minus the "six-shooters," he said. The candidates have spent many months "on the stump" or "stumping." That term comes from the early days of the American republic. "Imagine that you're going town to town by wagon or horse," said Grant Barrett, compiler of the Oxford Dictionary of American Political Slang and co-host of the radio show "A Way with Words." "And you're looking for a place that you can speak to the general public. ... You may literally find yourself standing on a [tree] stump." Candidates today may mount a stage or makeshift platform, but making a campaign speech from town to town is still called "stumping." FILE - Democratic presidential candidate Hillary Clinton speaks at a campaign rally in Tempe, Ariz., Nov. 2, 2016. 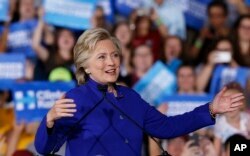 In a campaign stop the following day in Florida, Clinton said Donald Trump "has spent this entire campaign offering a dog whistle to his most hateful supporters." Candidates appeal to voters on a broad range of issues, and some make veiled appeals through a "dog whistle" strategy that conveys a message "between the lines," directed to specific listeners. "Let's say that if you talk about [mandatory school] busing in American politics, it immediately calls to mind racial issues or inner-city strife," Barrett said. The reference brings up debates about school choice, equality and race. Through this strategy, he adds, politicians can make appeals on controversial issues without addressing them head-on. The "gloves are off" in the final days of this campaign and both sides are "playing hardball." These are images from sports to describe aggressive tactics in the "presidential horse race." 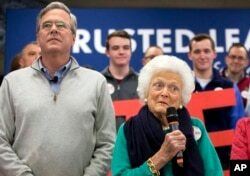 FILE - Barbara Bush, mother of Republican presidential candidate Jeb Bush, introduces her son at a town hall meeting in Derry, N.H., Feb. 4, 2016. The Republican campaign for the nomination because nasty early on, with multiple candidates hurling insults and disparaging remarks at one another and their critics. Mrs. Bush had recently complained that her son was too polite. This campaign, more than many others, has been noted for "mudslinging," which means insulting people. "This is an election where there's a lot of mudslinging," Burke said. U.S. presidents are elected on a winner-take-all basis in all but two states, Nebraska and Maine, which allocate electoral votes proportionally. There are red states (Republican) and blue states (Democrat). The colors are arbitrary, but have been commonly applied since the 2000 election, when they were used in graphic maps on television. States with that can go either way, called "swing" or "battleground" states, are often shown as purple. While every language has its slang, the English-speaking world has no official body to discourage its use, as France does. "So you'll find it on all levels of discourse—in American life, British life, Australian, Indian, New Zealand and so forth," Barrett said. These specialized idioms thrive in politics, where both sides are hoping for a "landslide" victory. No one is sure how an avalanche of soil crashing down a mountainside came to describe an overwhelming win. But Burke says this year, either side will settle for a win "by a whisker" or "a hair"—that is, a narrow margin.